Bills to ban fracking have been introduced in both the Florida House and Senate, with bipartisan support.1 Unlike their predecessors, Gov. Ron DeSantis and House Speaker Jose Oliva have indicated support for a statewide fracking ban. But the devil is in the details and it’s critical that ALL forms of fracking, including “acid fracking” are banned. Urge your state legislators to support a statewide fracking ban. Let’s seize this opportunity to win a strong environmental and public health victory for Florida. Lobbyists for dirty energy and monopoly utility companies will do everything in their power to stop the fracking ban, despite Florida being particularly vulnerable to the effects of dangerous drilling techniques like “acid fracking” and "matrix acidizing". That’s when acid is injected at high or low pressures to blast open rock or limestone deep beneath the surface of the earth to release trapped oil and gas. More than 1,000 cases of water contamination have already been documented near areas of fracking as well as sensory, respiratory, and neurological problems. Fracking in Florida would put our aquifers in peril, poisoning drinking water and risking the health of millions. Gas that is leaked during the fracking process, along with the numerous toxic chemicals that are used, creates air and water pollution that increases global warming and is a danger to human health and fragile ecosystems. 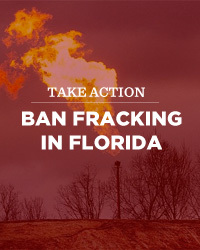 Take action today and help turn up the pressure on state lawmakers to ban fracking in Florida. More than 90 municipalities in Florida have already passed local ordinances banning this dangerous practice. The last thing Florida needs, with our delicate ecology and vast underground aquifer system, is fracking. Now is the time to make history and ban fracking throughout our state. 1Rep. Heather Fitzenhagen, R-Fort Myers has filed HB 239 to ban all forms of fracking. Legislators in the State Senate have also filed bills that would ban fracking.